This module provides two independent functions, a linear-to-exponential control voltage (CV) converter and a signal inverter. The linear-to-exponential converter can be used to tailor a linear control signal for input to a synthesizer module with an exponential control voltage response. This can be desirable in volume- and frequency- control patches such as using a CV scaled at volts-per-Hertz (V/Hz) as a VCF control input to track a V/Oct Pitch CV, or, shaping an Envelope or LFO control to a VCA, with the converter patched through the inverter. 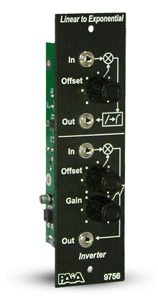 The inverter (with gain) may be used independently as a handy tool for inverting envelopes or obtaining complementary or mirror-imaged signals (one VCA LFO CV rises as the other falls). To purchase the assembled module, click the 9756ASM product page.